Students and families have access to our catalog and eBooks anywhere, anytime using your iPad, Android tablet, Smartphone, Chromebook, laptop or desktop by downloading the Destiny Discover app. Try it now, click here to go to the Lake Forest Library catalog or scan this QR code with your phone or tablet. HAVE FUN EXPLORING! *Having trouble with the app? Click here for additional help. 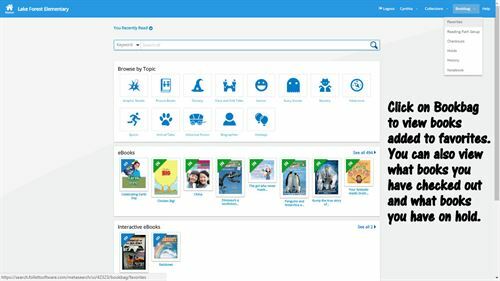 Browse the school library collection and check-out eBooks anytime, anywhere! Students use their school username and password. By browsing through the collection with the Destiny Discover App, users can search for eBooks, read them and check them out. 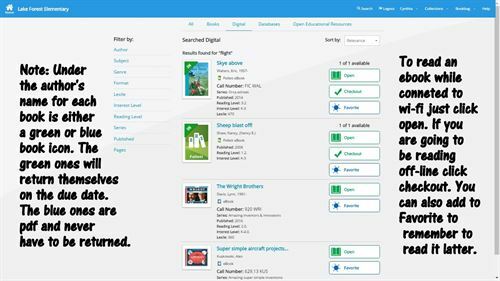 Users have instant access to Follett eBooks (the ones with the green book icon) or ABDO pdf books (blue book icon) with their personal devices from virtually anywhere. You can read online or download for offline reading. Follett eBooks automatically return themselves when the loan period expires and ABDO pdf books never have to be returned, just simply delete it when finished with it. The best way to learn how to use Discover is to simply just use it. The app is easy to navigate and self explanatory. Explore the other tabs here for helpful information. Note: You must be logged in under your own user name and password to add to favorites and place a hold.